Generally regarded as the “Father of Financial Planning”, Loren Dunton organized financial professionals in the late sixties and with their help created the financial planning movement. 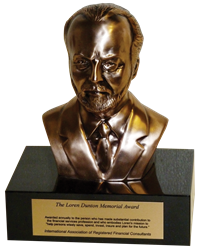 Loren Dunton developed associations, magazines, colleges, university programs and foundations. He was able to use his experiences to frankly explain what all financial advisors now recognize - that the ethical sales of financial products and the delivery of competent advice is a noble calling. Loren Dunton was a man of vision who cared deeply about both financial consultants and consumers. Rick Stanzione, R&R Group, Inc. – Washington Terrace, UT. The 2017 recipient will be decided at the end of the year with a presentation time and location to be announced early 2017. For more information on the award, go to IARFC website – Loren Dunton Memorial Award.